The Guardian’s front page carries the news that Sir George Barnes, “Director of Television at the BBC since 1950, is resigning next year to become Principal of the North Staffordshire University College, Keele”. The appointment takes effect on 1 September 1956. He will be the college’s third Principal since its formation in 1949. 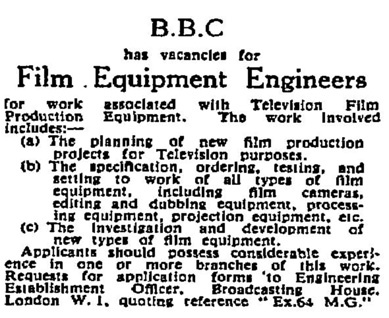 The paper’s London Correspondence column speculates on the identity of Sir George’s replacement at the BBC and suggests Cecil McGivern, the Controller of Programmes, as the most likely choice. The Times also carries this news. In the more immediate term, there are other vacancies at the BBC: Meanwhile, in the House of Commons, the practical difficulties of the fourteen-day rule were apparent. Sir Robert Boothy asked the Prime Minister if he would assure the house “that the Government would not give the BBC or the Independent Television Authority information which he was not prepared to give to the House.” This was a reference to the fact that Members of Parliament only learn what business is to be conducted on any given week on the Thursday before but television companies wishing to obey the fourteen-day rule need to have that information much earlier. The Prime Minister gave what The Guardian’s Parliamentary Correspondent described as “a lame reply” by saying “that it was open to any member to find out through ‘the usual channels'”. Why, if a television set displayed in a public area was found to reduce the amount of money coming in, would any business retain it? Mr Hooper does not say. The tabloids are rather too interested in Princess Margaret to worry much about television this week.